Want to Create a Great Marketing Postcard? Tell a Story. “Content is king.” It’s unclear exactly where the mantra originated (most resources point to a 1996 essay titled as such by Bill Gates), but recently, it’s been reiterated time and time again among digital marketers, in particular. The phrase means that content, or what is expressed through a medium, is the most important element of any online marketing campaign, more important than search engine optimization (SEO), for example, or campaign frequency. That’s not to say that SEO and campaign frequency aren’t important (in fact content works best, and significantly increases reach, when all of these elements are combined;) it just means that all of those things without useful, engaging content will not ultimately achieve the highest possible number of sales, social media engagement, website views, etc. Content applies to both online and offline platforms. In fact, a thoughtfully created content strategy that is consistent across all communications channels will have a strong domino effect: each piece of content, no matter the channel, will make the next more valuable. That means that the content of your postcard marketing campaign, for example, is of equal importance to the content of your social media post or email newsletter. So, how do you go about creating great content for your next series of marketing postcards? Simple: you tell a story. The term “storytelling” as a marketing skill has become more and more recurrent in the last five years or so. Today’s consumer is no longer content with simply hearing about the benefits of a product or service; they desire a deeper connection with a brand in order to convert. Many brands have been doing this storytelling thing for a long time. Think about Coca-Cola. The brand has many examples of emotionally endearing storytelling, just one being this “Happiness Factory” advertisement. In this ad, Coca-Cola isn’t selling their product in a traditional sense, by sharing how refreshing the soda tastes or conveying the satisfactory sound when you open a bottle -- they are sharing a story about the journey of a Coke bottle through a vending machine. For the audience, this ad instills a sense of wonder and feelings of warmth, feelings that are then subconsciously associated with Coca-Cola. 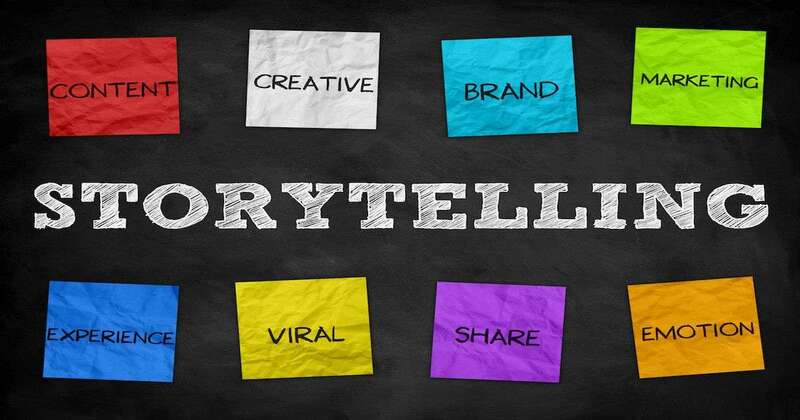 Coke provides a great example of storytelling, but you don’t have to be as extravagant as the mega-brand to connect with your consumers in an emotional way through storytelling elements. Begin with an emotion, and consider how that emotion relates to your brand. What feeling do you want your audience to walk away with when they look at your marketing postcard? Is it warmth, as is displayed in our Coke example? If you’re a nonprofit, maybe it’s personal responsibility. If you’re a B2B brand, maybe it’s trust or reliability. The feeling can be anything you want it to be; it just has to be universal. Identify a character. All good stories are centered around a character. This character can be human, an animal, or even an inanimate object, but as a general rule, the character should have features that are human-like, such as a personality and facial expressions. You run a cookie shop. Tell the story of a little boy who feels left out among his classmates. His mom orders a batch of cookies for the class in the hopes that it will help him connect with his peers. The boy’s classmates love the cookies, and he ends up making a friend. Through this story, your audience relates to a common human experience -- not fitting in -- and is left with feelings of positivity, hope and warmth. You run a nonprofit. Tell the story of a person your nonprofit serves: what a typical day for them looks like, how your nonprofit has benefitted their needs, and the impact your nonprofit has on their life. Your audience will walk away with a feeling of personal responsibility to help more like the person featured in your story. Incorporate a clear call to action that ultimately benefits your business or organizational goals. Include a visual element. There are many ways to tell a compelling story. If you write the story out in text form, always include a photograph or other image beside the text. Additionally, you can tell the story by way of graphics. Compelling visual imagery is the key to a great story. Have someone proof your story and answer the following questions: What emotion did you walk away with? What did you like about this story? Are there any ways this story can be improved or made more clear? Outside feedback helps ensure your story is strong and conveys the emotion you desire. Use a high-quality printing and mailing system. Nothing ruins a good story like poor color quality or postcard smudges! QuantumPostcards offers UV coating with every postcard order, which provides a protective layer to help prevent smudging, creasing and other quality issues. This process will help you create a story that is engaging and emotionally resonate, building relationships between your audience and your brand. Storytelling is in our human DNA -- you probably tell stories in your own life far more often than you realize. Why not start incorporating them into your postcard marketing campaigns, as well?